(VOVWORLD) - Various activities celebrating Mid-Autumn are underway across Vietnam. An art program themed “Connecting love” took place Saturday in Ho Chi Minh city, in which participating artists raised 2,200 USD for local disadvantaged children. 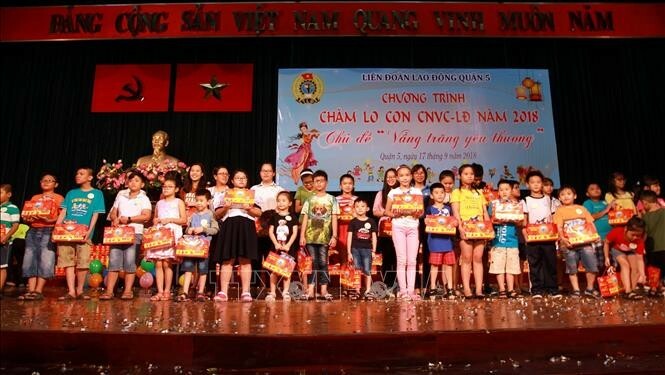 The same day, Ho Chi Minh city’s Union members held a special art program to give presents to disabled children and Agent Orange victims, and scholarships to students having outstanding academic performances. Quang Ngai’s Youth Council gave 1,600 gifts to disabled children and children living in remote areas while journalists and reporters in Nghe An dedicated a program to 700 disadvantaged ethnic minority children. The Voice of Vietnam’s Youth Union in the Central Highlands and Vung Tau’s Youth Union presented children in Ea Sup district, Dak Lak province with moon cakes, new clothes, and school supplies. Lo Ly Luan, a Thai ethnic child, said: "I really enjoy playing games and eating good food this Mid-Autumn Day. For me, this has been the biggest celebration so far. I’m looking forward to joining more activities next year."